As someone who writes – and more specific to this exercise, writes advertising – I have often found myself discussing (some would say, arguing) with people (clients, creative directors, spouses) about why what I had written should not be changed. Not because it was perfect, necessarily, but because their suggestions were going to do something to the copy that was going to wreck it in ways they weren’t aware of, and that I wasn’t capable of explaining to them. Look, any writer worthy of the title knows that he writes with some sort of structure, some sort of a logic that leads the reader from the initial “who cares” through the “I’m intrigued” all the way to the “don’t stop.” A writer knows that effect and attention are not arrived at by accident. Most of the time they just cannot articulate the “how” of it. Lisa Cron, an instructor at the UCLA Extension Writers’ Program, and a former agent, producer and story consultant, has written a book that while ostensibly only for writers of fiction, I absolutely recommend for everybody. For advertising and marketing copywriters, certainly; but also for account people, art directors, clients, marketing directors and anyone who wants to, or rather, needs to, understand how the words they are paying for work. Because it explains how stories work. Or more specifically, how they work in our brains. Stories, Cron explains, citing recent research in neuroscience, serve a very specific, practical, almost biological purpose. They “allow us to simulate intense experiences without actually having to live through them.” In other words, they allow us to learn something with our brains without having to have the physical experience. So you don’t need to get on a malfunctioning rocket ship headed to the moon with James Lovell in order to learn from that experience. And not only is that a good thing, it’s also a thing that separates us from other animals. Other animals can learn from their own experience, but because they by and large lack sophisticated language, they cannot relate stories of their experiences to each other. “Fire hot” has to be learned over and over again. Which is tremendously inefficient. And this is precisely why stories are so valuable in advertising. If we had to wait for everyone to, say, personally experience a new toothpaste before actually purchasing it, then Procter and Gamble would still be just two guys making soap and candles in Cincinnati. Advertising lets us tell stories about products so people can experience them in their brains prior to experiencing them physically. So they can learn (from you) that your new toothpaste is better, mintier or just plain funner than anything they’ve ever experienced before. And then go out and buy it for themselves. All of which are eminently applicable to advertising. Focus on what you want your customer to remember and eliminate everything else. Always be clear about who you are, what you’re trying to say and why they should care. And most importantly, create the drama that “all is not what it seems” implies. Because if all is as it seems, there’s no reason for the customer to pay attention. And they won’t. Our brains constantly seek patterns in order to anticipate action. (“The last three times I put my hand in the fire it hurt like hell. I’ll bet it will again.”) Stories allow our brains to pass on this experience to other brains (“Dave said the last three times he put his hand in the fire it hurt like hell. I better not put my hand in the fire, because now Dave’s a lefty.”). Understanding these two things is central to understanding how to make advertising that works. It’s also central to understanding what makes us human. Which will also make you a better writer. 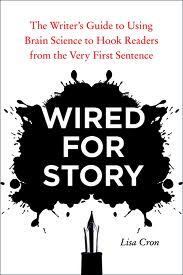 Wired for Story by Lisa Cron was published by Knopf on 07/10/12 – order it from Amazon here or from Barnes & Noble here – or pick it up at your local bookseller ( find one here).